The use of an external oil management service, such as FiltaFry, offers many obvious benefits to a restaurant. FiltaFry’s micro-filtering process keeps oil tasting better and lasting longer. The reduction in oil usage saves the business money. The technicians keep a kitchen’s fryers running clean and more efficiently. However, FiltaFry offers food service entities much more. When a business uses FiltaFry they are also taking an active step in improving employee safety in the kitchen. The Risk Every year hundreds of work related injuries occur in the kitchen of dining establishment. A great number of these are slip and fall injuries or burns associated with the kitchen’s fryers. These accidents result in time lost by staff, higher insurance rates for restaurant owners, large sums paid out for medical expenses and remunerations for injuries. Sadly, many of these fryer related injuries could have been prevented had the restaurant used a professional oil and fryer management service like FiltaFry. Why Use a Pro? Many restaurant owners and managers are tempted to rely on their staff for fryer maintenance that is, in all reality, beyond the scope of the staff’s expertise and capabilities. Not only are restaurant staff members undertrained to properly clean fryers and filter oil, but most restaurants lack the sophisticated equipment (such as the filtration systems used by FiltaFry) to perform these duties adequately. Employees generally do not have the motivation to consistently keep fryers and oil clean. The fact is, your employees are just not as compelled to go out of their way to perform duties that they see as mundane, unnecessary and inconvenient. It is a rare staff member indeed that recognizes that keeping a kitchen’s fryers in peek condition and maintaining the quality of the cooking oil improves the product they are offering, saves the business money and reduces safety risks. On the other hand, when you choose to use a professional service like FiltaFry, you can rest assured that your fryers and oil are consistently being maintained at top quality. 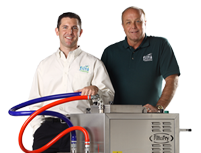 Far from unmotivated, FiltaFry technicians make a business out of making sure your fryers are operating at peak performance and that your oil is cleaner and lasts longer. They want your kitchen to be safer and to run more economically. In fact, they stake their reputations on their ability to help you achieve that. The Benefit Restaurants, on average, pay out over $5,000 each year for slip and fall or burn related injuries. Beyond the unnecessary expense, this injuries result in countless hours of lost employee time. Sadly, most of these injuries could be avoided with proper fryer maintenance. Using FiltaFry can help to drastically reduce your company’s risk of costly damages and expenses due to employee injury. Companies that report average or below average numbers of employee injures are able to save even more money when it comes to insurance. These businesses are able to save up to 25% on their insurance policies for showing consistent safety in the workplace. This translates into an average savings of around $1.400 per year on insurance payments. FiltaFry can work with you to help you meet your safety goals and standards so that your business can save money.